28 speaking roles plus several cameo parts; easily reduced or expanded. 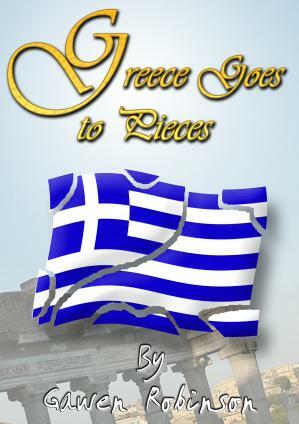 With nine memorable songs on a fully orchestrated CD (including backing) and a colourful humorous script, "Greece Goes To Pieces" can be performed as a full musical production, a shortened assembly piece or as an invaluable classroom teaching resource. The story is set in Athens around the year 400 BC. It is centred around an ordinary pot maker named Peta who introduces us to many of the famous scholars in Athens around this time such as Socrates, Plato, Hippocrates and Aristophanes. Peta Potter's pots (try the tongue twisting song if you dare!) tell many stories and we are transported for a while to Crete to see a mini play featuring the legend of Thesius and the Minotaur. Despite its wealth and splendour, Athens is going through a bad time. The Athenians have recently been defeated by the joint Spartan and Persian armies and now have to put up with foreign interference. The Spartans, being warriors, are very different in nature to the Athenians and have little time for culture and philosophy, so there is a tension in the streets between the two sides. Anxious to find out what is in store for their great civilisation, Socrates, Plato and Hippocrates set off on an exciting journey to see the great Oracle at Delphi visiting the Olympic games on the way. The Pythia tells them to seek advice from Zeus himself at the great statue in Olympus where they will discover their destiny.